I enjoy shopping in thrift stores, it’s like a treasure hunt. 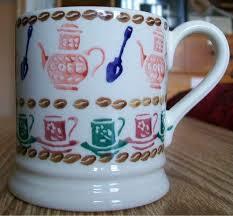 I went to one on Wednesday and found a one-of-a-kind Emma Bridgewater mug from England. It was only 25 cents! I did some research and could not find this exact mug online, but found it’s approximate value could be as much as $40. If I find any more of these, I am getting them. I was drinking out of it before, now it’s on display. Read here to read how another blogger got a tour of the factory where the mug was made. Pingback: Tatty Marsh in Singapore | Ohh, honey!